In the world of remodeling, competition is fierce. In most cities across the U.S., there are many talented contractors vying for local jobs, from intricate home remodels to commercial construction projects. In the modern digital age, how can you elevate yourself above the competition? The key may be in your remodeling company’s digital marketing strategy, with a well-designed website serving as the cornerstone. In the recent past, remodeling contractors relied heavily on personal recommendations to cultivate a client base and build a solid reputation. Today, however, word of mouth can only get you so far if you don’t utilize another approach. Your remodeling contractor website is one of the best tools in your arsenal for generating leads and attracting clients. Since most homeowners perform an Internet search when looking for a contractor, without a website, your company is essentially obsolete. But gone are the days when a basic website could do the job of engaging website visitors enough that they transform into clients. In our digital world, you need more than just a home and contact page in order to generate leads, attract customers, and keep them coming. 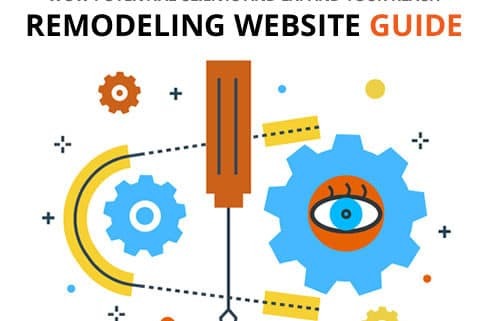 Whether you’re looking to update an old website or create an entire new one that aligns to your business model and values, you should familiarize yourself with the best practices of web design and digital marketing. Here’s what you need to know. When a home or business owner gets a remodeling idea, they’re constantly imagining, designing, and perfecting the perfect space in their mind. Visualization, therefore, is paramount in the contractor selection process. To keep visitors from passing up your website, give them plenty of eye candy as soon as they click on your company name. If you have a stunning portfolio to offer, you’ll help potential customers realize their vision even before they contact you directly. The process starts at ground level. At every job site, take tons of photos: Before, after, and during the remodel. Choose a handful of the best ones to showcase your abilities. You want potential clients to connect with the work that you do and trust that your company can handle any remodeling job. Use your photos on every web page and offer a more extensive “our work” page with detailed images of the jobs you’re most proud of. Make sure that your portfolio highlights your remodeling company’s versatility. If possible, include a variety of architectural styles, room sizes, and even color schemes. Was there a particular job that your company found especially challenging, forcing you to think outside the box or problem-solve on the spot? Share that experience with on your remodeling website. You have a variety of options when planning your website’s portfolio page. If a particular design aspect is your specialty — for instance, hardwood floors or intricate tile work, make sure to highlight that talent. You can even detail the process step-by-step, using a series of photos and graphics or a time-elapsed video, in order to increase a visitor’s confidence in your abilities. Images are essential when it comes to website design. However, keep in mind that too many visuals on a single page can distract visitors, which may cause them to look elsewhere for a remodeling contractor. A great website is one that’s streamlined and packed with information, yet not over-saturated. It’s a fine line, but one that’s easy to achieve. Three or four well-placed photos per job should suffice to keep a visitor’s interest peaked. Further, descriptions of both your available services and completed jobs should be direct and to the point. Avoid wordiness. This brings us to another crucial element of a remodeling contractor website: The content itself. Every person who visits your website should be certain about the services you provide, and this is where a transparent call to action comes in. Don’t leave any room for confusion regarding what you can do, the areas you service, or your hours of availability. If you don’t have one, consider implementing a simple tagline, such as the following: “Floors, bedrooms, kitchen and bathroom updates: We do it all!” Much like a catchy jingle in a commercial, a memorable catchphrase can keep your company’s name in the forefront of a person’s mind. As for the written information and descriptions on your website, it may be in your best interest to think like a journalist — keep content simple and concise. Redundancy and wordiness typically turn off potential client rather than attracting them. A 2015 study by The Economist found that “good” writing contains more verbs while “bad” writing is full of nouns and unnecessary adjectives. Excess words can confuse some readers and alienate others, both of which are detrimental to a growing business looking to expand and attract additional clients. Whether you create the web content yourself or outsource to reputable digital marketing agency, keep your content simple yet compelling. Home remodeling has a degree of intimacy involved, as a homeowner is essentially inviting strangers into his or her home. Therefore, you need to highlight your company’s trustworthiness on your website: If you’re licensed, insured, and bonded, make sure that information is easy to spot. Do you perform background checks on your employees? Share that information with potential clients and help ease their mind. Finally, add a human aspect to your company name by including a few customer testimonials. These can be as long as a blog post or presented as a powerful sentence or two. Studies show that testimonials and customer reviews are crucial in generating leads and attracting clients, especially at the local level. More than 90 percent of shoppers, in fact, rely on online reviews when making a purchase, according to Shopify. 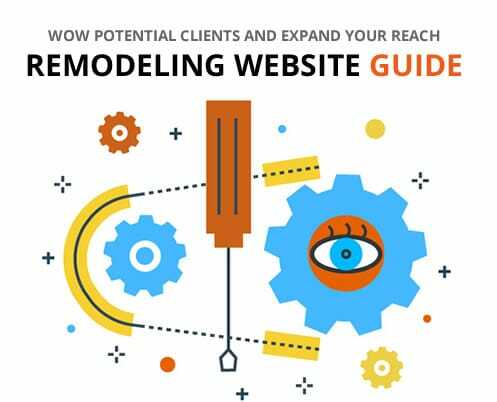 The ever-changing realm of website marketing can seem confusing, especially to a local remodeling company that’s been around for years. Don’t be afraid to shake things up by playing to your audience. In increasing numbers, homeowners are relying on the Internet for every aspect of their remodeling project, from gathering design ideas to selecting the right contractor for the job. What’s more, your potential clients are probably using their smartphone to browse the web. In October 2016, mobile use for Internet access surpassed computer use for the first time in history. You can reach those mobile users in greater numbers by making sure your remodeling contractor website is smartphone-friendly. 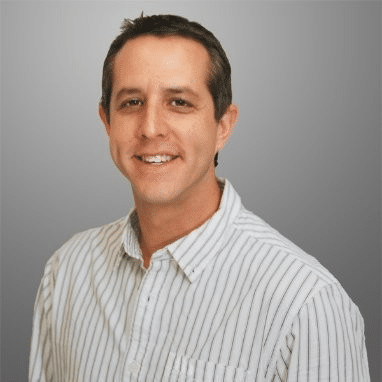 Expert sources, including Forbes, stress the importance of SEO in a small businesses’ digital marketing strategy. Many local business owners and managers, however, have only a basic knowledge of what SEO really means and how it can help drive traffic to a particular website. SEO is an acronym for Search Engine Optimization, which is a useful strategy employed by website designers and copywriters where they play to the keywords most commonly searched. For instance, if a potential customer in your area is performing an internet search, they may type the phrase “home remodeling in CITY.” Website content that is SEO and geographically focused will contain common search terms in order to get as close to the top of the search results page as possible. But a successful SEO marketing strategy involves much more than just keyword search terms. In fact, sometimes SEO-focused content is awkward and can sound unprofessional, leading potential clients to look elsewhere for the services they require. To keep your website relevant as well as in line with SEO best practices, it should be updated regularly. Information that is static, such as your company address, contact information, and service pages can remain relatively unchanged, and rotating web content should ideally be in blog form. Your blog is where you’ll further connect with potential clients and show off your skills by sharing information that’s relevant to those looking for a remodeling contractor. On a regular basis, typically weekly, write up an article that highlights something in the world of remodeling — for instance, architectural trends in your city, tips on staging a home for sale, ideas for decorating a newly remodeled kitchen, and more. When it comes to your website, blog subject matter is essentially boundless: If it has something to do with remodeling, construction, or your city, it’s likely perfect for your blog. Many contractors outsource this job to a content writer or digital marketing agency, but if writing is one of your hobbies, let your voice be heard. If you’re a people person and know how to use a video camera, you can even post video blogs (known as “vlogs”) or general how-to videos. Consider highlighting your recent work or showing website visitors how your company overcame an on-the-job challenge. These video posts can help you connect with website visitors in a profound way — not only will they learn something from your video, but they’ll get to see who you are, hear your voice, and learn about your personality firsthand. A video offers a personal touch that can’t usually be replicated on a general content page. Are you ready to generate more leads and expand your remodeling company? “Marketing” doesn’t have to be an intimidating word, especially where your business is concerned. No matter the locations you service or the size of your remodeling company, you can make a strong impact with a well-designed website that’s easy to navigate and is updated regularly. Contact Contractor Gorilla today to get started.